Call Recorder VoIP Cost effective voice recording over IP recording technology. 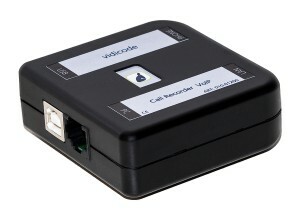 The Call Recorder VoIP records from one IP phone on your desk or record multiples (up to 4) IP channels. An easy to implement call recording solution for small to intermediate recording applications. It's a powerful little hardware and software combination that connects your networked IP phone to your computer via LAN and USB connections, allowing you to record phone calls automatically or manually. The Call Recorder VoIP the recording software supplied will store all calls in a comprehensive database including all available data such as; date and time, duration, phone numbers, call direction etc.. Thus ensuring that recordings can be found quickly when needed. Whether you are a single user, small practice, mid-size enterprise or even a Call Center; the Call Recorder VoIP (or multiple units) offers great functionality for a very low investment cost. Desktop and IP Soft phones With VoIP telephony the use of Soft Phones (or Soft Clients) has grown rapidly. The Call Recorder VoIP will of course also record from compatible Soft Phones as well as from desktop phones. Call Recorder VoIP comes as standard with one recording license and can easily be expanding with additional licenses up to 4 off IP phones. Call Recorder VoIP can record from SIP telephones but also a number of VoIP protocols like Cisco, Unify, Avaya, Alcatel and more. Vidicode will strive to keep developing the software to record new or changed protocols, but cannot be responsible for any incompatibility due to sudden changes by PBX manufacturers. For the latest compatibility list please enquire..